Our Funarena! : Cricket: Mahendra Singh Dhoni Named Captain Of ICC ODI Team Of The Year! Cricket: Mahendra Singh Dhoni Named Captain Of ICC ODI Team Of The Year! Laurels for Indian cricket team captain Mahendra Singh Dhoni. For the fifth consecutive year Dhoni has been selected in International Cricket Council (ICC)’S ‘ODI (One Day International) Team of the Year’ and this time he has been named the captain too. 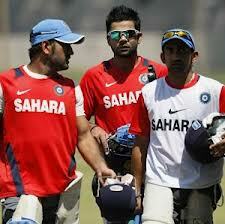 Not only this, Team India got its three players along with Dhoni selected—the highest for any team. Australia (Michael Clarke and Shane Watson), Pakistan (Shahid Afridi and Saeed Ajmal) , England (Alastair Cook and Steven Finn) and Sri Lanka (Kumar Sangakkara and Lasith Malinga) have two players each and South Africa has one (Morne Morkel). The other two Indian players are Virat Kohli and Gautam Gambhir. The ICC Chief Executive David Richardson announced the 'Squad' at a special function ahead of the LG ICC Awards being held tomorrow in Colombo, Sri Lanka. The LG ICC Awards honor the best performing international players and officials of the last 12 months. A specially appointed five-member expert panel headed by West Indies cricket’s living legend Clive Lloyd selected the twelve-member team. The other members of the panel were former Sri Lankan captain Marvan Atapattu, former West Indies skipper Carl Hooper, Australian all-rounder Tom Moody and former England women's team captain Clare O'Connor. This is indeed a good moment for the Indian team that already arrived in Sri Lanka for the ICC World Cup Twenty20. Dhoni has already expressed his hopes for repeating the World Cup-2011 achievement here too and if they do so India will have the unique distinction of being World Cup-2011 Champions, the under-19 World Cup-2012 Champions and World Cup T20-2012 Champions! Get cracking, Team India!